This is what the end of the racket looks like. In sports where you have to swing things, it’s important that you know what you’re doing. See, because you want the ball to go where it can do you some good like straight into the face of that stuffy witch who thinks she’s just too good to rent a racket like everyone else. Ahem, anyway. Sony Sports is showing off new sporty sensor technology to help up your game and has started with tennis rackets. Meg “I’m The Boss” Marco is strolling the floor at CES in Las Vegas this week and stopped by to check out this bit of electronic sportiness. She had a few burning question to start things off — Why tennis? Why not golf? “Tennis is for everybody,” the Sony booth rep told her. And “golf is expensive,” and mostly for older, high-income people. 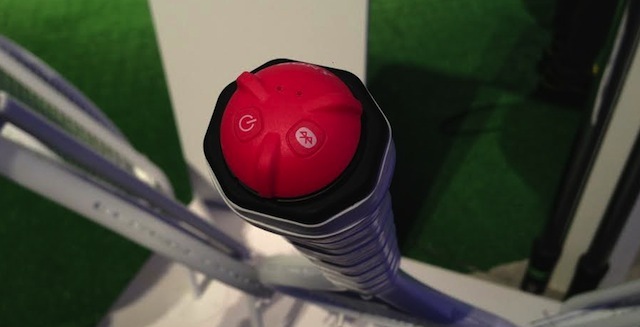 Here’s how it works: The racket is equipped with sensors that monitor things like shot count, impact position, swing type, swing speed, ball speed and spin rate, and then sends that information to your connected iOS or Android app via Bluetooth radio. That way you can take a look at your game and pinpoint possible problem areas, something that could come in handy in other swinging sports as well. And we mean swinging a baseball bat or something, not the other thing where people switch spouses. When we asked if this technology could be applied to other sports, the rep said that is a thought in the right direction. Okay so, baseball, specifically? “Definitely possible,” the rep replied. It might not make you the next Babe Ruth or anything — because that’s the best slugger I could come up with right off the bat — but athletes trying to perfect their form could find it useful. Previous 3D TV Is Dead. Will Glasses-Free 3D Resurrect It?